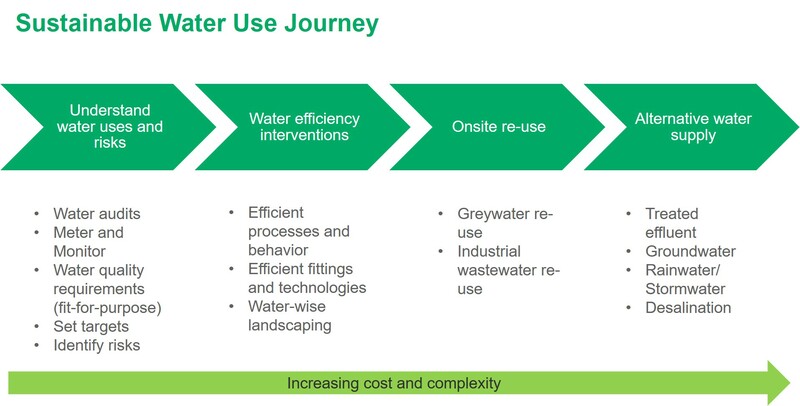 As a response to the water crisis and to help businesses adjust to the “New Normal” of water scarcity the Sustainable Water Use Journey has been mapped out and proposes actions for each step of the journey. As a first step, the below outlines what businesses can do to reduce their consumption. GreenCape's water programme concentrates on two broad areas: to improve the productive use of water to support sustainable economic development; secondly, to promote the uptake of green technologies and businesses. Visit the Water Sector Desk's website for more information. To support businesses during the drought, they have set up a Drought Business Support Page which consists of information on each step of the Sustainable Water Use Journey and the most Frequently Asked Questions (FAQs) that GreenCape receive from business with regards to the drought, and their answers. For any agriculture related queries you can contact Cathy.Pineo@green-cape.co.za. The 2018 Water Market Intelligence Report produced by GreenCape, which highlights business opportunities for water in the green economy in the Western Cape, is available for free download. In response to business concerns around the water crisis, a Western Cape Business Support FAQ has been developed to address some of the issues that have been raised. Use this poster to share what your business' water consumption is. The City of Cape Town has instituted Level 5 water restrictions since 1 October 2018 which limit water consumption to 70 litres of potable water per person per day. The City's Residential Water and Sanitation Services website provides all you need to know about current water restrictions and how you can save water at home. The City's Water Map provides information on household water use, treated effluent collection points and pressure management points. If you are looking at making use of alternative water sources, the necessary information can be found here. As residents have frequently asked about the use of sea water as an alternative source in their home, the City of Cape Town has developed Guidelines for the Collection and Use of Sea Water for Household Purposes During the Cape Town Water Crisis. Information on Water Management Devices can be found here. The City of Cape Town has also indicated that all water users in the metro should expect water rationing (reduced water supply) which will help see Cape Town through the drought. This guide provides all the necessary information. The City of Cape Town has developed this great poster as a guide on how to survive on 50 litres per person per day. For materials to raise awareness amoungst employees and guests clickhere. While these have been developed by the City of Cape Town, these can be easily adapted for businesses outside of Cape Town. To help you spread the word, the City of Cape Town have created water-saving information packs for your home, business and hospitality industry. This great Green Office Toolkit provides tips on how to make your office resource efficient. An Employee Water Information Pack has been developed which can be downloaded below and shared with staff explaining the current drought crisis, its impacts, understanding the water bill, ways to save water and what to expect during Day Zero. The Western Cape Government is running its H2O Hero campaign with tips on how to save water at home, in the workplace and in your neighbourhood. Within the context of the current water crisis in the Western Cape, this database is intended to assist private persons and businesses wishing to improve their water management systems and/or reduce the amount of water they consume to easily identify potential suppliers of water-related products and/or services. The suppliers included in the database have not been vetted or accredited by the Western Cape Government, the City of Cape Town and/or GreenCape. This database is published for information purposes only and does not in any way represent or constitute an endorsement of any particular supplier, product and/or service by the Western Cape Government, the City of Cape Town and/or GreenCape. Request potential service providers to provide references. The Western Cape Government, the City of Cape Town and/or GreenCape shall not under any circumstances be liable for any inconvenience, losses and/or damages suffered by any private person who and/or any private business that relies on the information included in this database and/or contracts with any one or more suppliers included in such database. Any suppliers of water-related products and/or services that wish to have their products and/or services included in the database are invited to submit their product / services information via form below.